A brand-new land-use sign is up on the periphery of the White Center Chevron at 15th/16th/100th, for a project titled Starbucks of South Seattle. The notice also mentions a separate permit application forthcoming for Popeye’s Fried Chicken. We won’t be able to reach the respective chains for comment until next week, but county records show the site – long listed for sale – was sold two months ago to Madison, a well-known Seattle developer, for $2,250,000. Right now, the standalone Starbucks nearest White Center – which of course has excellent independent coffeehouses including Caffé Delia and Dubsea Coffee – is in West Seattle’s Westwood Village shopping center. The nearest Popeye’s is in Renton. 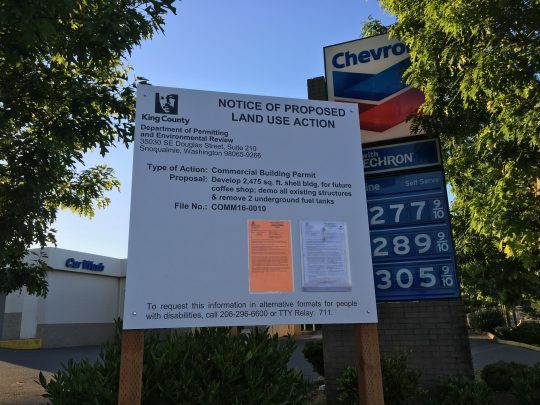 The infosheet that we found posted on the south side of the lot says a public comment period is open until June 27th, and describes the first part of the project as involving “development of a 2,475-square-foot shell building for a future coffee shop, demolition of existing convenience store, gasoline filling station, removal of two underground storage tanks, and car wash.” While the notice says the application was filed with the county May 9th, it lists the “date of mailing” as today (June 3rd). Wow, that’s a real shame. Robert, we covered the shooting for partner site WSB. At the time, it appeared to be primarily an SPD investigation with some help from KCSO. I apologize for not reposting it here but now it seems to be a KCSO-led investigation and I hope to finally get the report tomorrow (Tuesday). Yeah for Popeye’s…boo for Starbucks. Although Bok-a-Bok Chicken is really good too! This is wonderful news. White Center keeps on striving to become better and better. This is about 4 blocks from my house. Job opportunities and growth will push White Center to become a destination for people to travel to and shop. We already have coffee shops – good shops that are owned by local people. We do *not* need Starbucks. And as much as I have a [not so] secret love of Popeye’s, I would rather see local businesses come into that space. Any elimination of a gas station is never a bad thing. Will the Starbucks and Popeye’s be drive throughs? Great, low quality mass produced fast food to stink up the air. In addition to Dubsea & Delia, a new addition ‘Fresh Flours’ on Delridge & Cambridge also serves excellent coffee/espresso & stellar pastries. This developer taking an interest in White Center is a sign of things to come. Please continue to support the local businesses. I’m happy to have both Starbucks and Popeye’s there. I use Cafe Delia as often as I can, but they’re only open until 2p most days. Dubsea is awesome as well, but they often get pretty crowded. We can totally support another coffee shop in our area. The fact that Starbucks (and Bok-a-Bok) are willing to open shop in White Center means they recognize that businesses can thrive in White Center. A lot of companies don’t believe that. I’m happy to show them they’re wrong. I also oppose commerce. People can raise chickens in their house, slaughter and eat them. Coffee can also be made at home. This should be a vacant lot, or maybe a tent city. Down with progress. Why go get nasty chain fried chicken when there are so many more better local choices in town? And for anyone interested, we’re still working on the followup to this. Starbucks would not confirm the plan for this site, despite it being right there in writing on the sign. Haven’t reached the right person at Popeye’s yet. @Joe – that was one of my questions for Starbucks, whether it would be a drive-thru – given the location and the planned size of the building, I can’t see how it would be anything but. There are always negatives, and the two existing locally-owned coffee shops are owned by very good people who embrace our community. But this redevelopment is good for the White Center Business District. You can say what you will about Starbucks, but several years ago their company implemented the one-week community effort to completely re-develop White Center Heights park, spending over $1,000,000 (million) here. This was a gift to the people of White Center. That park was closed off and a haven for problems before Starbucks funded our community effort to invest in ourselves. Thousands of volunteer hours made it happen because of Starbucks resources and leadership. As the president of the White Center Chamber of Commerce for three years (2010-12) we pushed the importance of using the new library siting as another example of re-development that would benefit the White Center Business District. A small group were against it, for silly reasons really, but look how beautiful that area is now. The nearby businesses love it, as does the elementary school across the non-arterial street. Careful community-planned reinvestment and limited re-development is essential for the White Center Business District is become an attractive all-hours small business district destination for families and young people. When this happens, the existing businesses will see a surge in healthy retail and food service spending. Starbucks IS a local business that employees TONS of local people. Stuck up anti-Starbucks sentiment is so dumb. To answer the questions about drive-thrus….yes, both the Starbucks and Popeye’s will have them. If anyone wants to see the layout of the project, there are flyers on the permit board showing it. As for the independent coffee shops, I am certain they will survive and thrive even with Starbucks. But this project will be a more inviting gateway to WC. I am excited to see this development and hope that more restaurants and other businesses will continue to grow in our area. The local businesses will survive just fine, as many cuisine-and-business specific establishments will continue to cater to our diverse populations. I readily profess a general aversion to the too-tall, retail-underneath condo developments we see in the Junction area these days. And I worry about rents and housing costs, hoping they climb in line with jobs and wages, a challenge in our region these days.